Japan welcomes more and more visitors from abroad every year. The number of inbound tourist in April 2018 was 2,901,000, up by 12.5% year on year (according to the Japan National Tourism Organization), the highest number of inbound tourists Japan has ever received in a month. This number is expected to grow even further leading up to 2020, and as such, Panasonic is developing and promoting an extensive range of solutions to make their stay in Japan even more enjoyable. - Hands-free tourism service, "LUGGAGE-FREE TRAVEL"
- Autonomous delivery robot, "HOSPI(R)"
- Multilingual translation service, "Megahonyaku"
- Docomo Bike Share "Smart Sharing"
- Multi-video distribution system, "VOGO Sport"
- Autonomous mobility with the robotic electric wheelchair, "WHILL NEXT"
*Some of the solutions introduced here are still in their proof-testing stage. 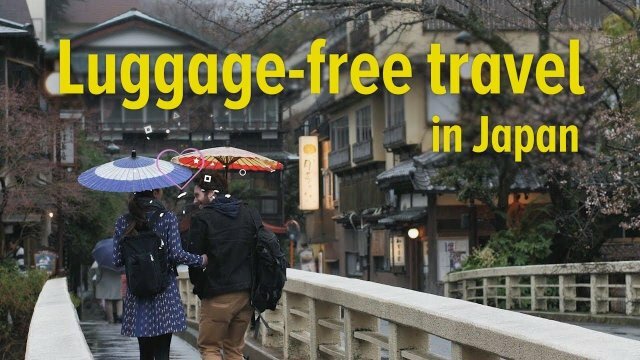 Hands-free tourism service, "LUGGAGE-FREE TRAVEL"
Three companies, Panasonic, JTB Corporation (hereafter referred to as "JTB"), and Yamato Holdings Co., Ltd. as the logistics partner launched "LUGGAGE-FREE TRAVEL" nationwide in 2017, a service that gives international travelers the freedom to enjoy the sights in Japan without having to carry their luggage with them. 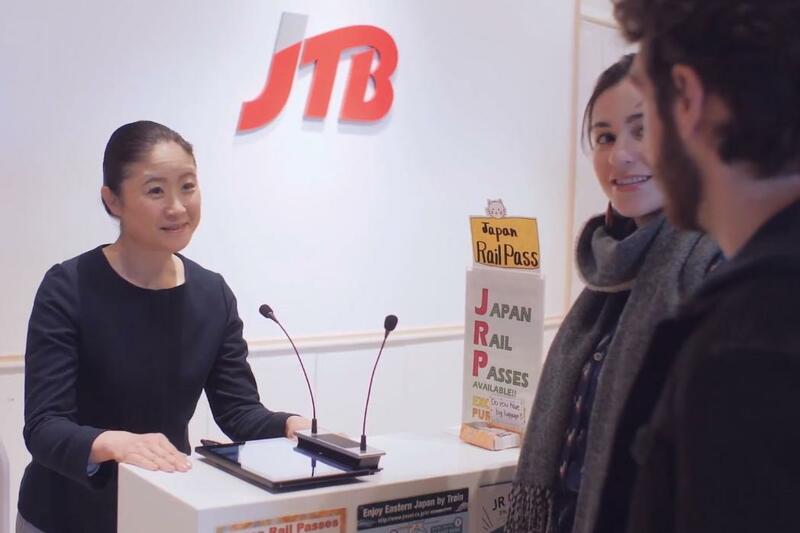 By making a reservation online in advance, travelers can have their large pieces of luggage transported from the airport upon their arrival, during their stay in Japan from accommodation to accommodation, and to the airport when departing. Travelers no longer need to fill in a waybill in Japanese like in the past. All they have to do is go to an agent's counter, scan a QR code, confirm the reservation on the screen of the multilingual terminal, and click OK. 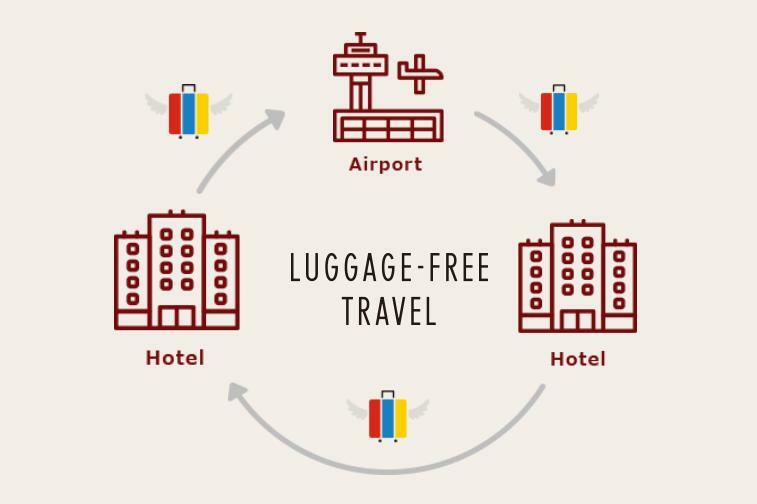 This service proposes a new style of travel, which frees travelers from the hassle of carrying their luggage with them and allows them to enjoy shopping and other activities, and even make a little side trip. JTB launched this service on August 8, 2017 through its packaged tours for inbound tourists, "Sunrise Tours," and from January 5, 2018 it has also begun taking reservations and offering this service online for individual travelers kicking this service into full gear. The 3 companies will continue to work together to improve the service by, for example, by adding more delivery areas and drop-off counters. "HOSPI(R)" is a robot that is capable of making deliveries on behalf of people. Based on the pre-inputted map information and using high performance sensors and a sophisticated obstacle avoidance algorithm, the robot can recognize its surroundings and avoid bumping into passersby and objects to safely and efficiently deliver various objects. Moreover, like conventional delivery systems, this robot neither requires the installation of devices into the walls or ceiling, nor guide tapes along the floor, so changes to the destination or layout of the facility can be easily made and at low cost. "HOSPI(R)" is already being used to deliver medicine and specimens in hospitals in Japan and around the world, but since 2017 demonstration experiments of the robot in airport lounges to take away used tableware and in hotel lobbies to offer beverages are already underway, so there are hopes that the robot will be of service in many other situations. Panasonic will continue to examine the utility and accelerate its efforts to develop a market ready robot, so that it can serve bottled water to users or provide hospital services to travelers by, for example, announcing shuttle bus arrivals. In November 2017, Panasonic began provision of its multilingual voice translation service, "Taimen-honyaku," which allows people to communicate face-to-face in their respective native languages. Spoken Japanese may be voice translated into English, Chinese (simplified Chinese/traditional Chinese), Korean, and Thai and vice versa. At the same time, you can display the translated content on the tablet's screen, supporting smooth audio communication between people providing and receiving service. The tablet comes pre-installed with approximately 200 fixed phrases allowing users to easily select the desired sentence from the list (*). Users can also run an audio word search for images. *Additional fees are required to add fixed phrases. - Wi-Fi is necessary to use the "Taimen-honyaku." - Panasonic plans to add Indonesian, Vietnamese, Spanish, French, and Burmese in the future. "Megahonyaku" is a megaphone-shaped translation device unveiled in December 2016 that will automatically translate and playback fixed phrases in Japanese in English, Chinese, and Korean. It can help users smoothly guide spectators and customers in various locations and scenes such as at transportation hubs like airports, train stations, exhibitions, events, halls, and stadiums, as well as theme parks and tourist destinations. The megaphone-shaped translation device comes preloaded with approximately 400 fixed phrases. And by simply choosing a word, users can use approximately 4,000 different phrases. Basic functions like record and playback is only one click away with easily accessible buttons. Panasonic also offers a cloud service that allows users to add phrases (*). Software updates are also distributed via the cloud. Docomo Bike Share "Smart Sharing"
"Smart Sharing" by Docomo Bike Share Inc. (hereafter referred to as Docomo Bike Share) is an eco-conscious cycle sharing system that has combined bicycles with mobile handsets (25 locations nationwide, approximately 7,300 bicycles, and approximately 700 cycle ports as of March 2018). By registering via the smartphones, a user can start using a bicycle from the cycle port of his/her choice and park it in a cycle port nearby his/her destination. Even international travelers can easily start using and return the bicycles, so there are hopes that the usage of this service will expand even further in the future. Panasonic has been collaborating on this service with Docomo Bike Share since 2016, proof testing the battery sharing business, maximizing the battery capacity while minimizing its size, and developing more compact, lightweight bicycles. The new model expected to launch in the summer of 2018 is significantly different from the first model from 2 years ago, and much easier to maneuver even for taller international travelers. 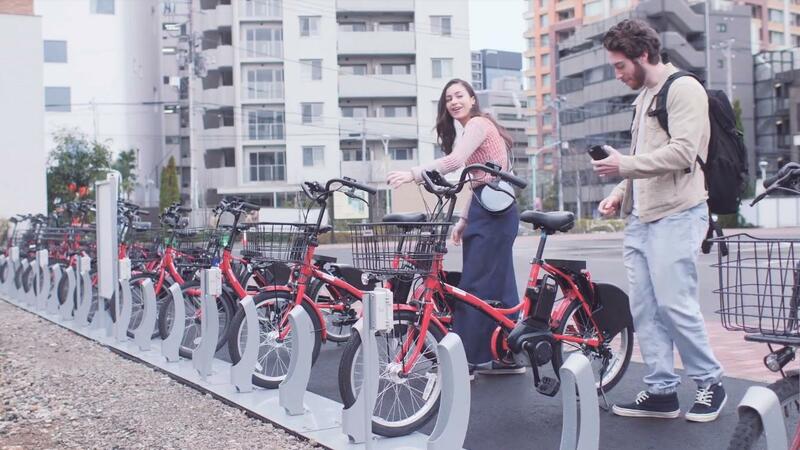 With 2020 in sight, Docomo Bike Share and Panasonic will continue to accelerate efforts to create a social infrastructure that minimizes environmental impact. Multi-video distribution system, "VOGO Sport"
"VOGO Sport" is a multi-video distribution system that delivers video to smartphones and tablets in the stadium. Spectators can enjoy and switch between live video shot from multiple angles with audio just by installing the app on their mobile terminals and connecting to the dedicated Wi-Fi. They can watch any scenes they missed or enjoy a replay, and even watch athletes on the other side of the field by pinching and zooming in. With a new viewing style that allows spectators to use their smartphones, etc. as a second monitor, Panasonic will deliver new joy and excitement to sports fans at the venues. *VOGO Sport is the trademark of VOGO SAS. Panasonic Information Systems Co., Ltd. is the exclusive sales agent of VOGO Sport in Japan. According to a survey among international travelers conducted by the Japan Tourism Agency on public transportation systems, 2 in 3 international travelers at the airport are having difficulty figuring out their way from the airport. So working together with Jorudan Co., Ltd., a company that provides route search/transit planning service and using LinkRay(TM) technology, Panasonic designed a signage that works with smartphones to provide transportation information. This is a one-stop service that provides optimal transportation information to international travelers in multiple languages. ID signals are transmitted on LED light sources of displays and lights and when users put their smartphone app up to the light, they can receive information about sights to see and how they can get there in their native languages. And with the cooperation of Keikyu Corporation, at the Haneda Airport International Terminal station LinkRay spotlights allow users to search and access transit information in multiple languages by simply casting their phones over the transit map. Panasonic's Light ID solution "LinkRay(TM)"
Autonomous mobility with the robotic electric wheelchair, "WHILL NEXT"
"WHILL NEXT" is an autonomous robotic electric wheelchair Panasonic co-developed with WHILL Inc. Many more travelers are expected to visit airports in Japan, and this robotic mobility will help realize safer, more comfortable mobility for Passengers with Reduced Mobility (PRM). In FY 2017, Panasonic verified the following technologies: (1) automatic stop function, (2) autonomous mobility function, (3) tandem movement function, and also conducted an onsite analysis with the cooperation of airlines to examine ways to reduce the workload for staff and improve convenience for customers. Panasonic will continue to develop this wheelchair so that in the future theses wheelchairs will become staples of the airport that allow users to use an app to call the wheelchair to their location, move about autonomously along the designated route without bumping into people or obstacles, and enable multiple wheelchairs to move in single-file as a platoon. *In developing the "WHILL NEXT," Panasonic has received a grant from the New Energy and Industrial Technology Development Organization (NEDO).